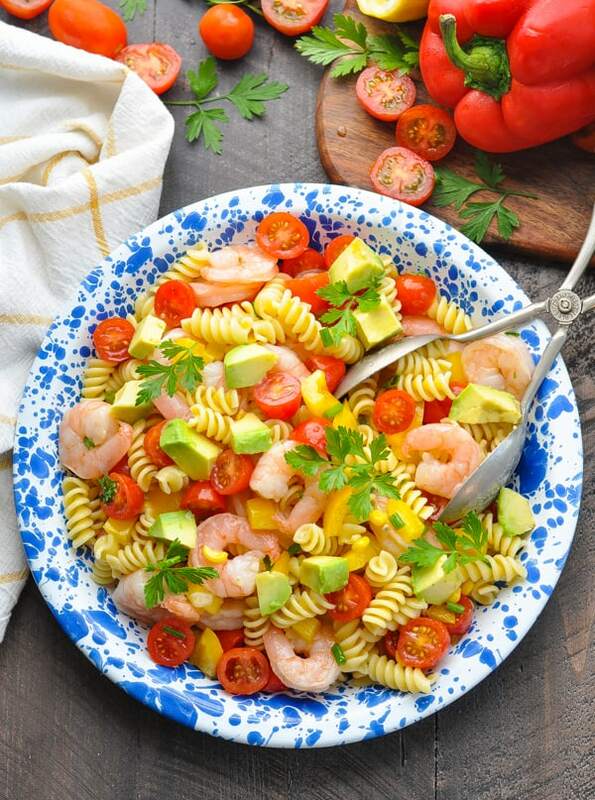 This fresh pasta salad is a perfect side dish or light entree for the summer! 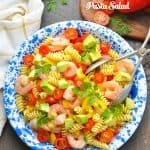 As a side dish or as a light main course, this Avocado Shrimp Pasta Salad is healthy, satisfying, and incredibly delicious. Our entire family enjoyed it for two nights in a row! 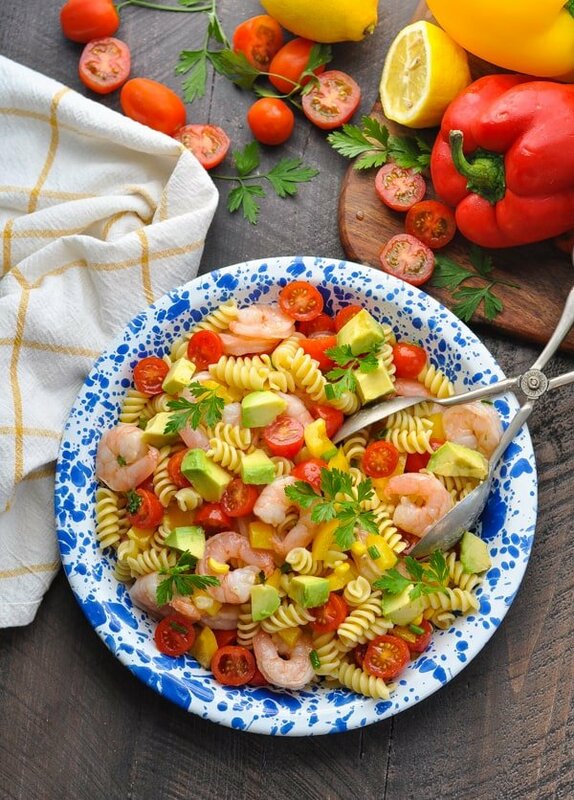 This recipe for Avocado Shrimp Pasta Salad was originally posted in July, 2014. The photos were updated in July, 2018. I’ve been working hard to serve my family fresh, nutritious meals and the summer season makes that so much easier! There is tons of tasty produce available, and a cold salad for dinner sounds very appealing. Even the dressing on this salad is light and refreshing made with olive oil, vinegar, lemon juice and fresh herbs! I was interested to see how my boys would feel about this dish when I served it for dinner recently. Well let me tell you: this is 100% kid-approved! We ate it as our main course on a Saturday evening and Casey had 4 servings! Gibbs also finished his. The very next night we polished off the left-overs as a side dish with some grilled steaks — surf n’ turf, style! It’s that good. 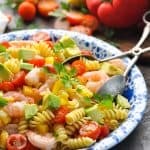 You’ll be the hero at your next potluck with this shrimp pasta salad in hand, and you’ll make your weekly meal prep simple by spending just a few minutes in the kitchen on Sunday afternoon. 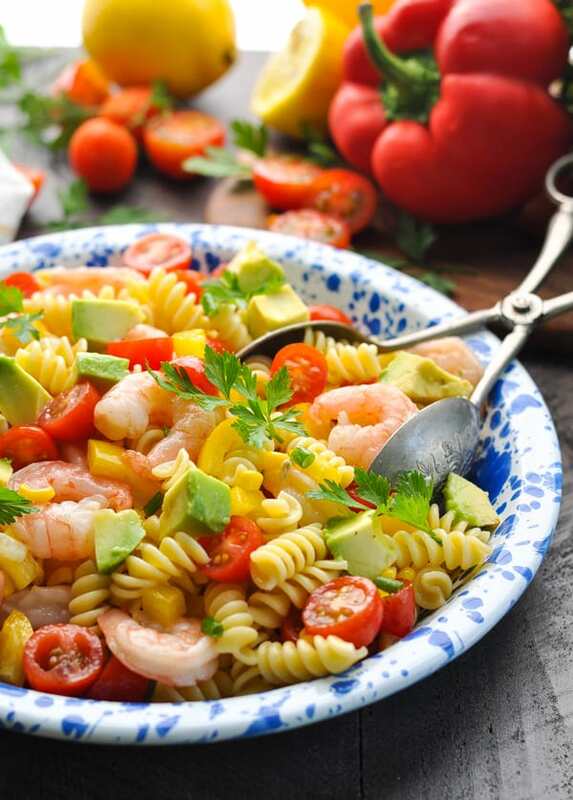 Whether you enjoy it for packed lunches all week or for a healthy dinner on the weekend, I hope that you love the perfect combination of shrimp, avocado, and fresh vegetables just as much as we do! 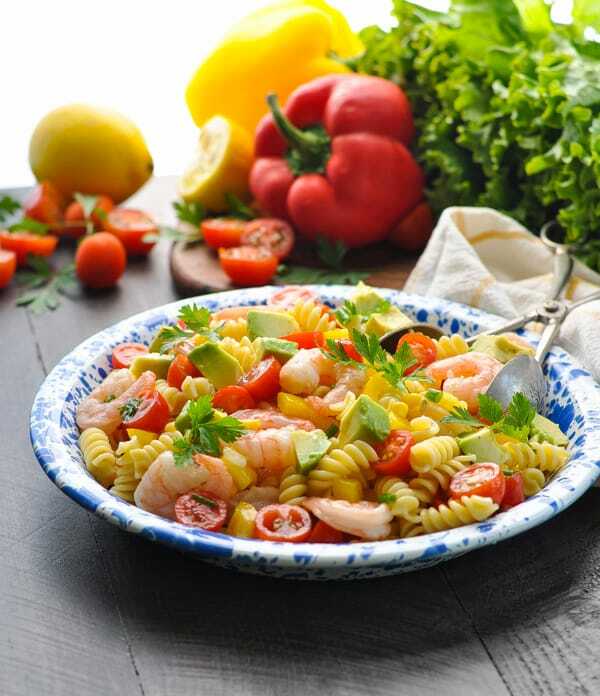 It’s also the perfect pasta salad for taking on picnics, serving at barbecues or having as a side in the summer. What ever way you’ve just got to try it! I used frozen cooked and peeled shrimp, which I thawed in the refrigerator overnight before using. It’s easy to do this prep the night before. 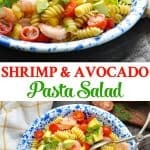 If you’ve tried this Avocado Shrimp Pasta Salad or any other recipe on The Seasoned Mom, then don’t forget to rate the recipe and leave me a comment below! You can follow me on Facebook, on Instagram, on Pinterest, and on Twitter! Cook pasta according to package instructions. Drain and rinse under cold water until pasta is cool. Combine all dressing ingredients in a jar with a tight lid and shake until completely combined. 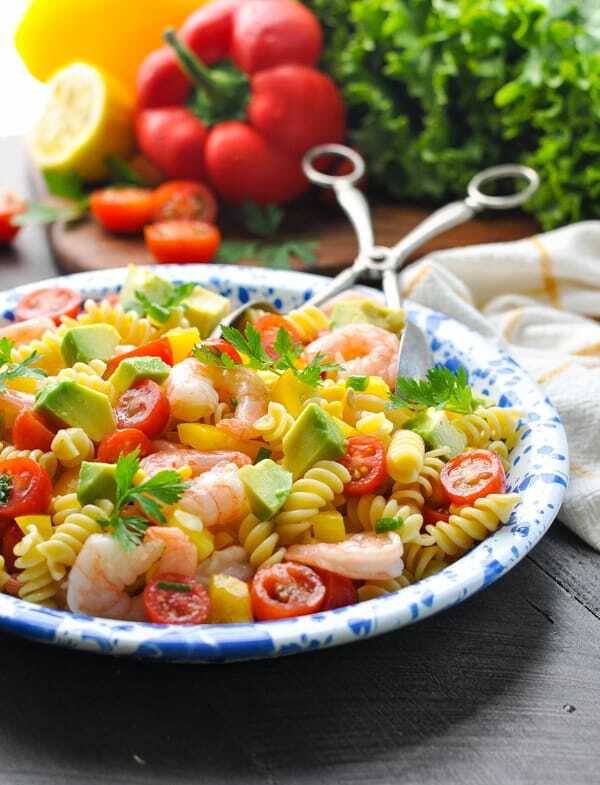 In a large bowl, combine shrimp, cooked pasta, tomatoes, chives, bell pepper, and corn. Drizzle with dressing, to taste, and toss to coat (I used about 1/3 cup of dressing, but you can use more if you prefer). Reserve remaining dressing in the refrigerator for up to 1 week. Cover and refrigerate salad until ready to serve. Just before serving, stir in diced avocado. Garnish with fresh parsley, if desired. Cooking Just for Two? Cut all of the ingredients in half. The rest of the instructions remain the same. This really looks good! 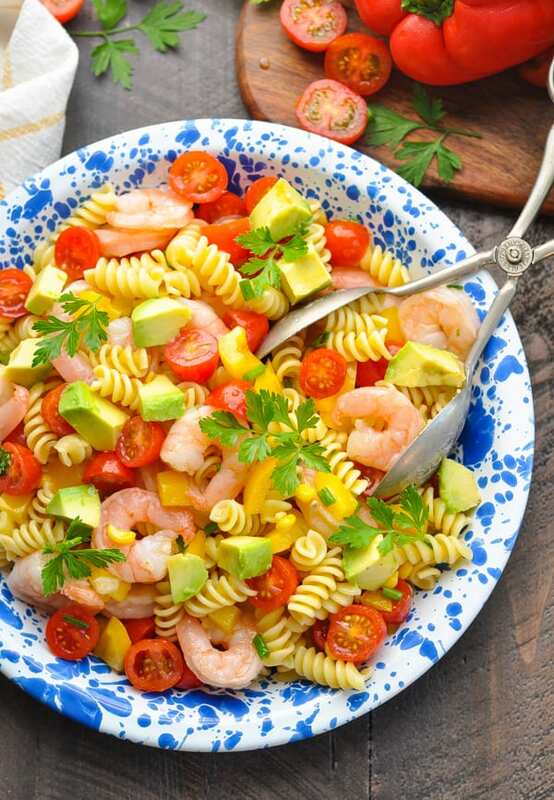 Shrimp and pasta with avocado, sounds great. Pinning to my Summer Salads board. Stopping by from Happiness is Homemade. Congrats on being our most viewed link this week at Freedom Fridays!!! Pinned and will be sharing on social media!! Thank you, thank you, Evelyn! I Love the sound of this salad, I’d definitely serve it at barbecues..yum! Have you tried this with other vinegar flavors, like ACV or salad vinegar? I can’t wait to make this! I am not a mustard fan either, but sometimes it’s worth adding. Yes, the other vinegars will work perfectly fine. Just pick your favorite! I’m making this right now! Smells amazing!